Make a perfectly tender whole chicken in your slow cooker. In a small bowl mix together the paprika, garlic, coriander, herbs, nutmeg, salt, pepper and the olive oil into a paste. Put the chicken in a bowl and rub the paste all over including in the cavity. Cook on high for 3.5-4 hrs. Remove the chicken from the Crockpot and set aside on a plate. Scrape any bits stuck to the bottom of the pot from frying with a silicon or wooden spoon. Let the chicken rest for 10 mins before serving. Make sure you check the internal temperature of the chicken using a thermometer (guidelines state meat is done when the internal temperature reaches at least 74C (165 F)). Continue cooking if internal temperature is less than 74C (165F). Cook at a high temperature to ensure your chicken is cooked all the way through. You want your chicken to reach an internal temperature of 74C (165F). 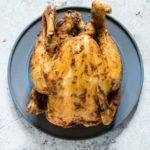 If you want a crispy skin on your whole chicken use your broiler once the chicken is cooked in your Crockpot for 5-10 mins. Check out the ‘How to Make Homemade Chicken Gravy’ section above with step by step instructions to compliment your whole chicken. There are 7 Freestyle points in each serving of this slow cooker whole chicken.